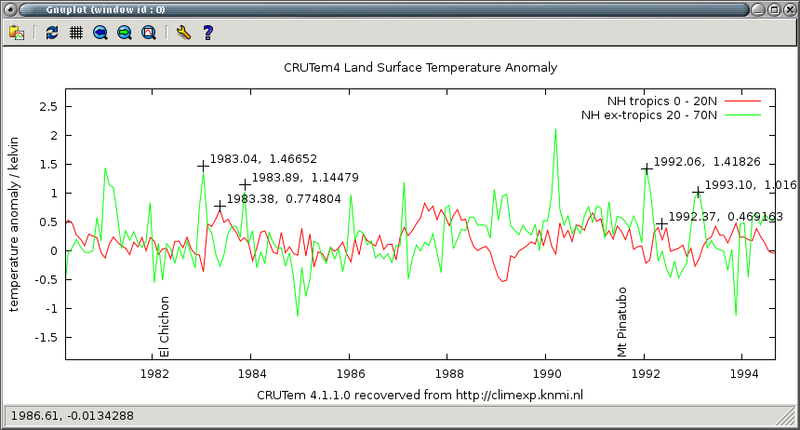 Separating tropical and extra-tropical NH land temperature anomalies from CruTem 4.1.1.0 reveals features that appear to be attributable to volcanic activity. Following El Chichon the extra tropical NH land temps reveal the most evident perturbation to the annual cycle is that the two following winters warmer. The tropical NH shows an almost coincident winter cooling followed by a sharp rebound that takes temperatures considerably higher than they were before the eruption. This is repeated the second year with a lesser amplitude. A very similar pattern of behaviour follows Mt Pinatubo, however this is superimposed on a strong downward trend. Failure to recognise that this downward trend was already happening well before the eruption will likely lead to a spurious attribution of this cooling to eruption. Comparing the two events it seems clear that if there was a response in the climate system to these events it was a temporary warming with no long term offset. The exact opposite of what is usually assumed and what is produced by what is programmed into climate models.